This post is sponsored by Grund America. I started making our new home more “me” with the half bath because, honestly, it was the most do-able (aka the smallest) room in the house. Remember what it looked like before? 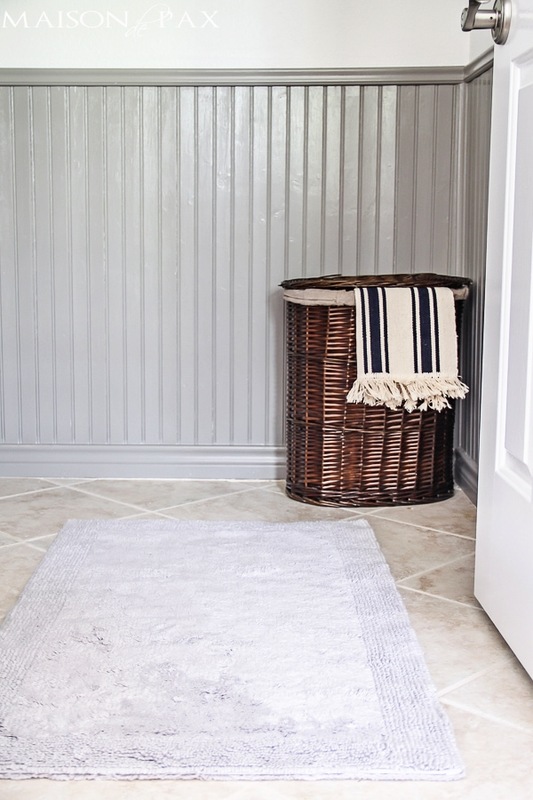 And I just added a touch of luxury thanks to this Grund Organics Puro bath rug. Even though this is just a half bath, it’s our only downstairs wc, which means it doubles as our pool room. Wet kids changing suits need a hamper and an absorbent rug… and this one is perfect. In fact, I might just need one in the master bath, too. I’m telling you, it’s like walking on a cloud. So to celebrate my birthday, I’m thrilled to team up with Grund America to offer you a chance to win your own Puro organic cotton bath rug in the size and color of your choice. Just use the Rafflecopter below to enter. Giveaway ends September 15, 2015 at midnight. And if you’re too impatient to wait until then or you need more than one, you can order your own Puro Organic bath rug (or a variety of other beautiful bath rugs!) from Grund America. Just go to www.grundamerica.com and use “Maison20” at checkout to receive 20% off! Discount good until October 8, 2015. Grund products can also be purchased online at bedbathandbeyond.com, wayfair.com, and amazon.com, but the “Maison20” discount is only available on the Grund site. Disclosure: A big thank you to Grund America for sponsoring this post and offering a rug as a giveaway! As always, text and opinions are 100% my own. You can read my full disclosure policy here. I would choose one from the Puro Series – probably the driftwood! Happy Birthday Rachel and thank you for the giveaway opportunity! I LOVE THE GLORY RUG IN CHOCOLATE! I just discovered your blog and look forward to reading it when it arrives in my mailbox! We’re redoing bathrooms at our house and one of the rugs would be beautiful! Thanks! I would choose gray 21×34! Perfect, and awesome size! Happy Birthday! Thanks for the great giveaway, these rugs look extremely soft. Like them all, would choose a white one. Have a great day! Those rugs look luxurious! I want one! Happy birthday Rachel! Mine is on Friday, I hope you have a good one! Happy Birthday! We need a new rug for our master bath and you have convinced me that this brand is one I should consider. Who could resist “walking on a cloud”. Happy Birthday Rachel!!! I hope you have a great one! Mine is in 10 days so maybe I’ll be lucky and win this one. Ha! I would choose the rug in white…always my favorite. Thank you for the opportunity! It actually is my birthday today!!! A happy one to you! Oh happy birthday to you, Vickie!! Your bathroom is so pretty! And I’m loving that rug – it looks so plush! I would choose the organic puro series in graphite!!!! Love the Puro rugs, maybe in white? Thank you Rachel and Happy Birthday! Oh I so love the progress of your bathroom…I know that the renovations in your home are going to be stunning….What a great rug and love that it is made of organic fibers…it looks amazing in your bathroom…and Happy Birthday Rachel…have a most wonderful one with the ones you love!! i would choose the dark grey which would look great on our white floors! 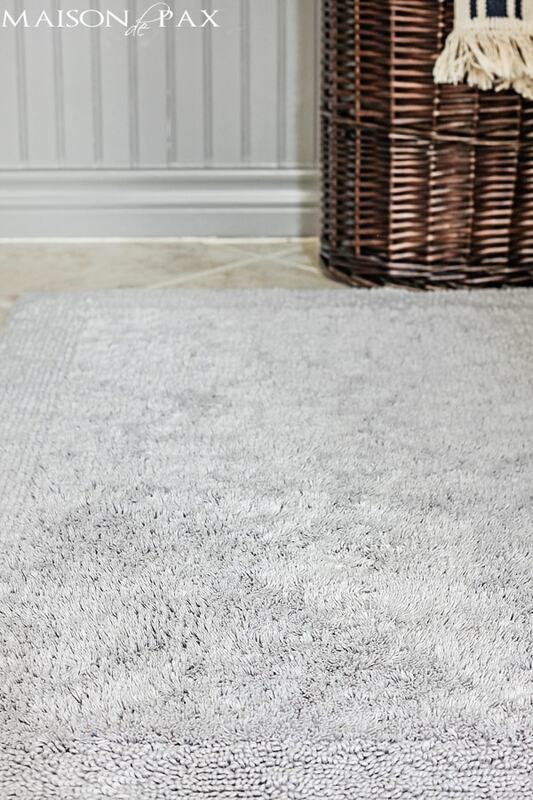 Love these rugs, they look so soft and cosy, love the Riffle in white! Your bathroom is looking lovely! I love the fresh new look of your bath! The rug looks super soft and cozy. Happy Birthday, Rachel! I love the bathroom makeover, and the mats are divine! Entering now! Happy Birthday!! Oh these look so soft! I love the Puro in white. Happy Birthday. Enjoy your special day. Panna…or maybe Graphite. Two totally different directions I’m considering. I like the PURO_7306.. Thank-you for this wonderful giveaway! HAPPY BIRTHDAY, my sweet friend!!!! I can’t believe I have not followed you on instagram!!! Now I do! Beautiful rug and a great price!!! Thanks for the giveaway! Happy Birthday, Rachel! Hope it’s a great one! 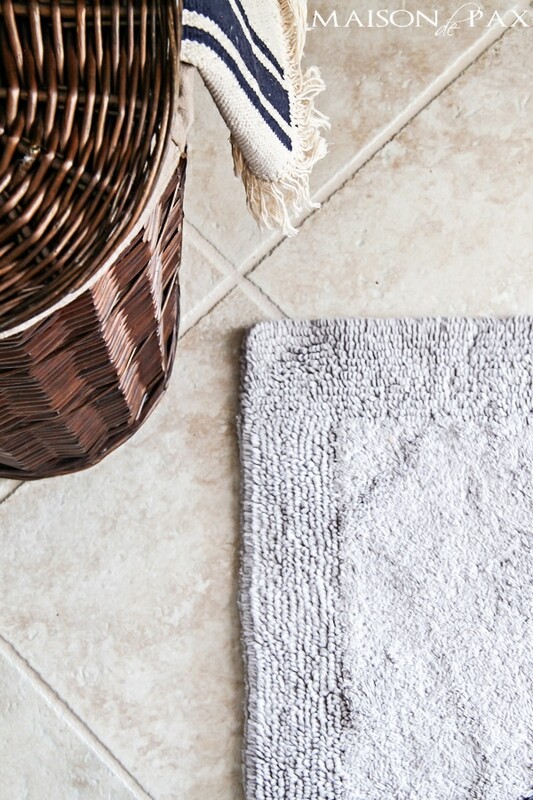 The organic cotton bath rugs are really wonderful! Oh my I would love this rug. It looks soft and lovely. Happy Birthday! Thank You for the Giveaway! Graphite! And the 40x24in size for my upstairs bathroom. Happy Birthday! Hello, love the rug, I would definitely choose the gray! I am such a ‘gray’ person, I just love certain shades of gray. Happy, Happy Birthday! And thank you for the gift! (IF) That’s a lovely idea, I may try it myself, give someone a gift on my Birthday, sounds fun and so unexpected! Oh I love any and every nice soft rug under my feet! I would love to win this since my birthday is today too and we plan on remodeling our bathroom soon! Oops..I’d love to win the white/light gray one. I would choose the grey it matches my bathroom colors grey and black. Happy Birthday. Love to step on that rug. Very very pretty and happy birthday! Ooooo plushy! They look great! All 2.5 of my bathrooms need a good revamp since they’re stuck in the 80s! Haven’t decided which one I want. But I would love to have one. 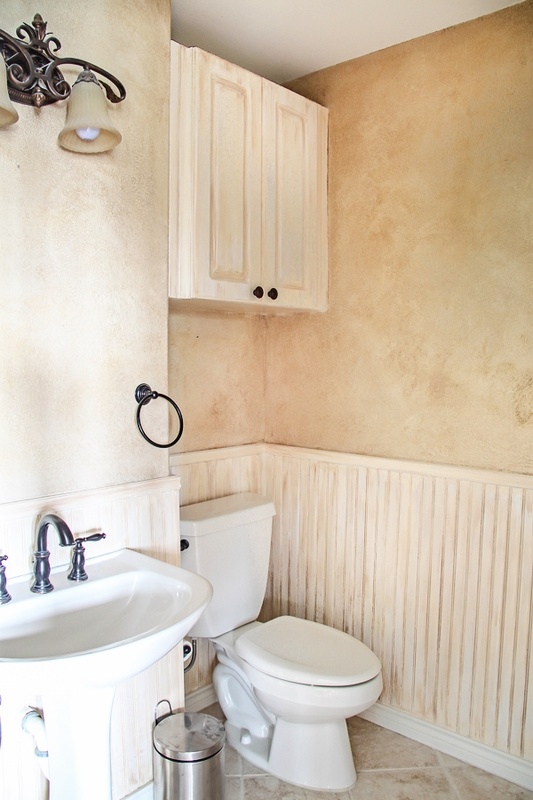 I would choose beige tones for my bathroom that looks a lot like yours! The room is looking beautiful, Rachel! I’d pick the gray– so pretty! Happy Birthday, friend! I love the white one. It could go in any bathroom! Happy birthday to you. And, I feel ya we are doing a entire home remodeling job as well. This company is fantastic..I have spent the last 30 minutes reading about what great work they do with these countries and the process they utilize to help the team earth. Love that. The also have so many great looking rugs from so many regions. But, this giveaway selection is the one I would have selected. The rugs look luxurious and cushiony..I need that as our floors are hard. I would chose the large rug in white or driftwood if I am lucky enough to win. Love the grey one! Love that they are organic & made environment friendly! HAPPY BIRTHDAY! White is perfect for either of my bathrooms. I almost forgot…I hope you had an AMAZING birthday too!! Oooh. That looks so luxurious! Organic Puro they look soooo soft!!! Thanks for the giveaway and Happy Birthday!! I would probably choose the driftwood or graphite for my kid’s bath which desperately needs a makeover! I love how yours has come together. Would love the softness under my feet! 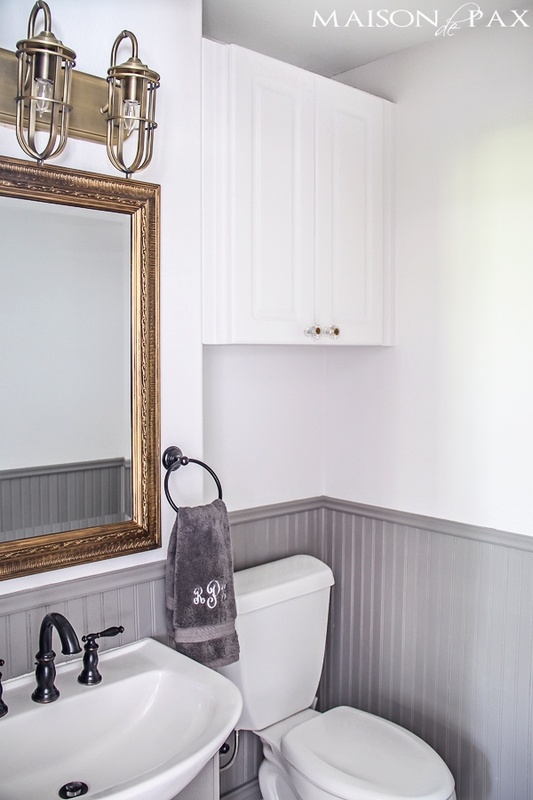 Love your bathroom makeover…especially fond of the grey woodwork. Think I’d get the large rug 24×40, was it?) in graphite. Happy Birthday! Love the colours you chose and that mat looks very soft. I would choose the Large #7299 — not sure what they call the color. Panna maybe? Happy birthday! I would choose the grey rug. Awesome! I love the Grund ® Organics Puro Collection in Panna! I would love the same one you got it would be perfect in my bathroom. Love the panna color (light tan?) in the medium size!! Would look great in our new bathroom! The grey or cream rugs would be gorgeous!! I love them all! The white or beige or black are awesome!! I love the grey ones! I think I’d have to get a big one. They look soooo luxurious! Happy Birthday! Your bathroom looks amazing!! I had to show my husband the before and after and he even loved it (he’s picky😳😉). I might get the organic puro series in graphite.